CHICAGO--(BUSINESS WIRE)--Jun. 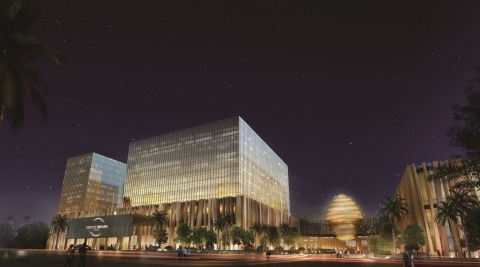 3, 2014-- Hyatt Hotels Corporation (NYSE:H) and Melco Crown (Philippines) Resorts Corporation (“Melco Crown Philippines”) announced today that a Hyatt affiliate and Melco Crown Philippines have entered into a management agreement for Hyatt City of Dreams Manila, which will consist of two hotel towers and is expected to open in 2014. Set to feature 365 guestrooms, the hotel will provide an intimate setting with direct access to three distinctive entertainment venues, including a family entertainment center, a live performance lounge and a nightclub that will be situated in an architecturally unique ‘Fortune Egg’ structure. Additionally, the hotel will offer two food and beverage areas, a fitness center, VIP lounge, and outdoor swimming pool. City of Dreams Manila is strategically located in the gateway of Entertainment City overlooking the Manila Bay area. Boasting easy access to Manila’s business district, as well as ‘SM Mall of Asia,’ Hyatt City of Dreams Manila will cater to both business and leisure guests given its proximity to entertainment, dining and shopping options. Melco Crown (Philippines) Resorts Corporation, with its shares listed on the Philippine Stock Exchange (PSE: MCP), is a subsidiary of Melco Crown Entertainment (SEHK: 6883; NASDAQ: MPEL). It is currently developing City of Dreams Manila, a casino, hotel, retail and entertainment integrated resort in Manila, which is expected to open in 2014 and have six hotel towers, including the Crown Towers hotel, Nobu Hotel and Hyatt City of Dreams Manila, numerous specialty restaurants and bars, gaming facilities, a multi-level car park, as well as three separate entertainment venues. For more information about Melco Crown Philippines, please visit www.melco-crown-philippines.com.